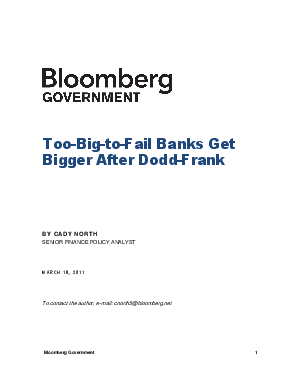 In this revealing study, Bloomberg Government exposes how the Dodd-Frank law includes a provision that could allow the largest financial firms, even those subject to concentration limits, to grow even larger. That could occur during a future crisis, when those firms will have the most flexibility to take control of failed firms. As a result, large banks will continue to grow disproportionately to other banks. DESCRIPTION: Bloomberg Government provides a single source for data, analysis, analytical tools, and news on the business impacts of government actions. Real-time access to aggregated news from thousands of sources from around the globe.